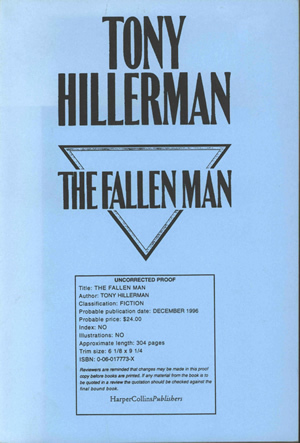 This is the uncorrected proof/advance reading copy of The Fallen Man by Tony Hillerman. The first edition was subsequently published in December of 1996 by HarperCollinsPublishers. This copy has a blue paper cover. Printed on the front are the author's name and novel title in black, above the uncorrected proof notice. The back cover is blank. This edition gives insight into a usually unseen process of promoting a book before publication. An advance reading copy is the uncorrected proof that is distributed, without charge, to journalists, book sellers, and celebrities for review and for promotional purposes. This is usually done a half a year in advance of the book release, both so any errors can be corrected and so any endorsements can be printed on the dust cover. Binding: Pale blue paper covers. Publishing information printed on the front cover in black.